This page is about the crew members I do not yet have enough information to create their own page. Bruce served on HMNZS Gambia duing WWII. Bruce had a pennant he aquired at the Japanese surrender, in 2015 it was at Ex-navalmens Club in Domain Street, Palmerston North, New Zealand. In 1943, William Chorlton was aged 38, and a Stoker Petty Officer on HMS Gambia. He was married to Lilian Alexandra Chorlton (36) at All Hallows Church, Bispham, Blackpool, Lancashire on July 17, 1943. Both had previously been divorced and Lilian lived at 11 Waller Avenue, Bispham, Blackpool. Williams father was Arthur Chorlton, labourer and Lilian's father was John Oliver, a deceased decorator. The marriage was performed by Rector Henry Ward and the witenesses were Alfred Salisbury and Sarah Sherwin. Rayner was born on September 13, 1923 in Wellington, New Zealand. He joned the navy on October 1, 1941 and served as signalman until January 5, 1946. He served on HMNZS Philomel (October 1, 1941 - February 7, 1942), HMNZS Achilles (February 8, 1942 - September 21, 1943), HMNZS Gambia ( September 22, 1943 - November 4, 1945, and HMNZS Philomel (November 5, 1945 - January 5, 1946). He was the husband of Doreen, and father of Jack, Anne, Bill and Peter. Rayner passed away on August 10, 2004 aged 80, and was cremated at Waikumete Cemetery, New Zealand. Joseph was born on February 21, 1921 at Grey Lynn, Auckland, New Zealand. He was 17 when he enlisted in the RNZN in 1939 with service number NZDA/1790. He served during WWII on HMS Achilles, HMS Gambia, and HMNZS Ngapona as Chief Yeoman of Signals. He was awarded the 1939-1945 Star, Atlantic Star, Pacific Star (Burma clasp), War Medal 1939-1945, New Zealand War Service Medal, Royal Navy Long Service and Good Conduct Medal with bar. After WWII he was a Post and Telegraph Department Employee and then the Warehouse Manager of a shoe factory. In 1966, he was awarded the British Empire Medal (BEM) while in the Royal New Zealand Naval Volunteer Reserve. His service number then was NZV 111005. He was married to Jean and the father to two children, Sheryl and Warren. He was a past President and Patron of Eden-Roskill Returned Services Association. He passed away on May 28, 2013 at Caloundra, Queensland, Australia, aged 92. 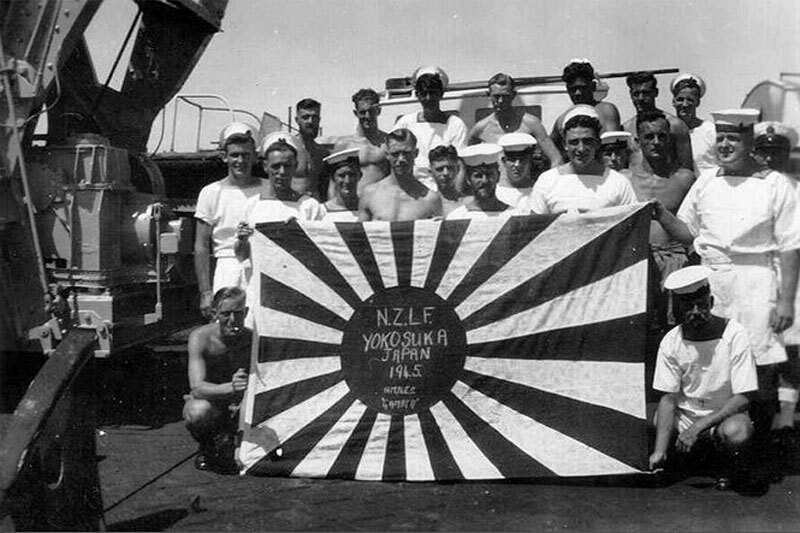 Tom was in the New Zealand navy with the service number RNZN 9147. He was married to Dorothy and father to Bev and Peter. Thomas passed away on October 10, 2013, aged 89. Stan was a telegraphist on HMS Gambia for the 1952 to 1954 commission. He passed away on September 11, 2005. Mr. Coulter was an able seaman serving on HMS Gambia's 1955 to 1956 commission. He passed away on April 6, 2004. Allan Crawford served on HMNZS Gambia as a Torpedoman 1st Class on HMNZS Gambia and was present at the Japanese surrender. RNZN and TS Gambia representatives were present at the funeral in Henderson and did a fine Haka to send him off. See RNZN Communicators Association site for original post. John was born in 1936 and was a Royal Marine who served on HMS Gambia for the 1957/58 commission. He passed away on July 10, 2012. The writers and contributors of the RNZN Communicators Association have been a wonderful source of information. In November 2018, Shane Scott wrote that the crew member 4th from the right in the above photo looks like his granddad, Lindsy Cummings. Lindsy served on HMS Gambia from 1943 to 1946 as radar operator and pom-pom gunner. Lindsy attended the 1983 reunion in Hokitika, New Zealand, but passed away around 1994. Roy was a Royal Marine gunner who served on HMS Gambia from January 1944 to February 1946. He passed away in December 1980.